This is simple tool for email list verification. Tool created for verify email list of not big size and when you need instant visual results. So you inputing emails list to text area, clicking "Start Verification" and getting visual result without page reloading. You can copy-paste it to some text editor, but can not download it as file. It's very useful thing then you just checking little group of emails, but this tool not compatible with our "anti-greylisting" feature. Verify email list in two easy steps! 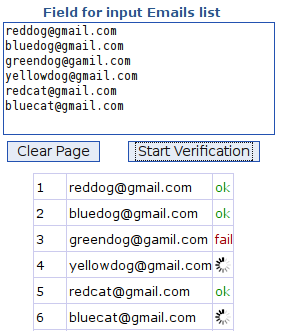 It is very easy to use Verify Email List with our tool, you do not need to have any technical knowledge and it's take few of time, see examples below. *** You pay only if email verification status is "ok" or "fail".